So where have I been and what have I been doing? Well, last Saturday's picnic inspired me. We used a plastic dollar-store tablecloth for our picnic blanket and I thought how much nicer it would be to have a lovely patchwork picnic quilt. I thought about some of the vintage sheets in my fabric stash (some fun green-striped ones from my Mom) and how I've often seen pretty sheet patterns at the thrift store. An idea was born. I do have a bit of a tendency to go off the deep end with new projects and this one's no different. My plan requires 42 16.5"x16.5" squares and 672 4.5"x4.5" squares. So the past couple days, I've been cutting squares like a madwoman. I have half the large and a third of the small squares cut out so far. On Monday, I found an awesome blue-purple 60s-style flowered sheet at the Sally Ann. On Wednesday, one of my crafty girlfriends gave me some leftover vintage sheet and pillow case bits from an apron-making day that I had missed. On Thursday, I found three suitable pillow cases between a local church bazaar and a local thrift shop (and two skirts that were $3 each!). I plan to use some of the sprigged cotton in my stash for a bit more. My aim is to mainly have it be pale shades of blue, purple, pink, and green. I don't want to overwhelm it with the striped sheets of which I have a TON. However, 672 squares is a lot. I think a polka-dot is necessary and a cherry-print would be a picnic classic. There is also probably much fun thrift-store rummaging in my future. 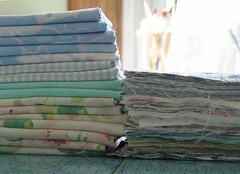 I'm aiming to mostly use fabric that I already have or recycle stuff I find on the cheap. It's both thrifty and environmentally conscious! I also like the idea that every square will have a story. It won't just be "oh I bought all this fabric new". Despite how far away the actual finished quilt is, I am having tons of fun imagining all the sunny picnics in its future: spread out when we're joined by lots of friends, folded a bit for pillowy comfort when it's just my sweetie and me, the edges pulled around when it's a bit chilly.... oh the picnics we will see!